Celebrate Spring at the National Cathedral! “Bring in the May” with Washington Revels during our fun and festive celebration of Spring at the All Hallows Guild Flower Mart — a popular two-day festival held on the grounds of Washington National Cathedral since 1939. DC’s favorite spring outdoor family event features plants, herbs, food, puppet shows, carousel rides, boutiques and entertainment for the whole family! This year, the Flower Mart celebrates the special theme of “Pollinator Power,” highlighting the essential contribution of bees and butterflies to gardens (and ecosystems) everywhere — and Revels joins in on the pollination proceedings by crowning not one, but two, “Monarchs” of the May to preside over our festive contribution! The Flower Mart culminates Saturday in Washington Revels’ annual outdoor May Revels performance marking the “greening of the year.” The merriment kicks off with a boisterous procession as we parade in to the notes of our “Noisy Band.” Enjoy traditional dances performed by our “Tween Chorus,” delightful singing games brought to life by Revels Children, and a Spring mummers play filled with butterflies, bees, faeries, slapstick comedy and bad puns galore. Sing along on timeless Spring songs like Wild Mountain Thyme and everyone’s favorite musical-memory challenge, Rattlin’ Bog! 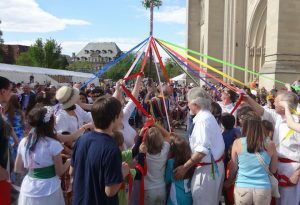 Finally, be sure your children are watching closely during our colorful (and intricate) Maypole dance — after we finish, it’s their turn to get in on the fun! Join us as we welcome Spring in Washington! DATE/TIME: Saturday, May 4, 2019 10–5 pm; May Revels start time TBA, approximately 4 pm.